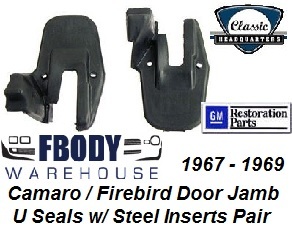 These rubber seals go on top of the door jam striker area on a 67-69 Camaro and Firebird. U shaped seal screws on and sits on the ledge where the rear quarter glass rolls down. Quarter window U-jamb seals with steel inserts as original. Superior quality rubber compounds to all competing products. RH and LH pair.